Look how far we’ve come! I never thought I’d get him to eat a bowl full of whole food goodness like this Poke Bowl. He was living on fast food and junk food before we started cooking together. Just goes to show that with some time and patience it is possible to make the transition from empty calories to nourishing meals. Better foods start us on that upward spiral towards better health and happiness, and better relationships all around. If you are looking to help one of your kids make these kinds of changes, check out my services page for private and group coaching options. I always love to help! The benefits of learning how to make these changes are endless and well worth the time and effort! 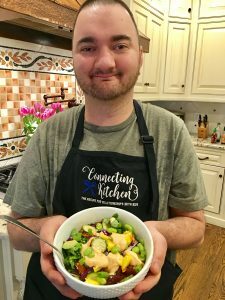 See how easy and fun this Poke Bowl is to make (video below). No cooking required (unless you count the steamed rice). Look how proud he is of his creation. I can’t say enough about how learning to cook builds confidence and self-esteem, and that’s on top of everything else. I have to admit that we both started the day out feeling low-energy, and kind of blah. In the past, this probably would have sent us spiraling downward into a big never-ending argument. 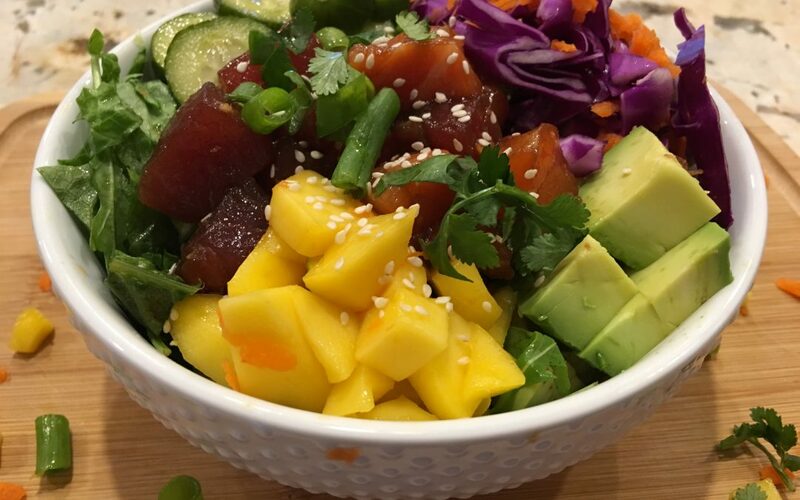 Instead, we were able to reach into our storage tank of all the good memories that we’ve created in the kitchen, and use them and this Poke Bowl to lift us up. Each time we get together to cook, it just gets better. We now help each other up instead of bringing each other down. This Hawaiian salad is light and flavorful, nutritious and delicious. So many reasons that this recipe makes us smile. It never ceases to amaze me. Is this really us? We are working together. The pickled cucumbers were a very tasty addition to this recipe. Do this first to get them going. Cut the cucumbers into thin slices. Mix the rice wine vinegar, water, honey, salt, and red pepper flakes together in a glass jar and add the cucumbers. Put the lid on and let them marinate. In a large bowl mix together the soy sauce, toasted sesame oil, Sriracha sauce, and honey. Grate the fresh ginger into the bowl. Use a fork to mix well and to blend in the honey that has settled to the bottom of the bowl. If you are using 2 types of fish, divide the marinade into 2 bowls. Cut the raw fish into small chunks. Add the fish to the bowl of marinade. Let it sit while you chop up your toppings. In a small bowl, mix together the ingredients for the Sriracha Mayo. 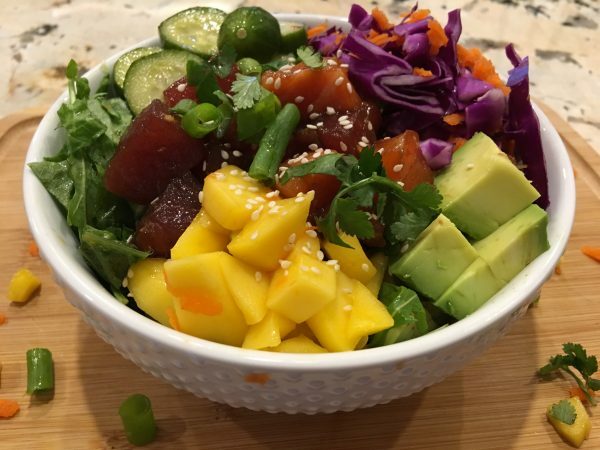 Assemble your Poke Bowls. Spoon steamed rice into the bottom of a single serving bowl. Add chopped greens such as Romaine lettuce and arugula. 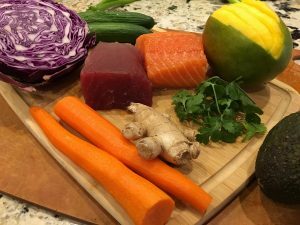 Add a few forkfuls of the marinated fish, some diced avocado, mango, edamame, cucumbers, shredded purple cabbage and carrots. Pour a few tablespoons of the left over marinade into your bowl as a dressing. Top with some Sriracha Mayo and sesame seeds.